Joan Rivers Great Hair Day® fill-in powder provides the appearance of fuller hair instantly. Applied to your scalp with the included brush, Joan Rivers hair powder resists running yet washes off without staining. Formulated with Procapil™, an ingredient designed to strengthen hair at the roots. Includes flip-open mirror. 0.24 oz. Note: At this everyday low price, this item is not eligible for additional discounts at the order level. Use the pointed end of the brush to part the hair where you want a fuller look. Turn the brush around and dab a generous amount of the powder onto your scalp. Be sure to start at the back of your head and work your way to the front to achieve a natural look. I have balding/thinning areas in my hair from medications so my scalp shows more than spot next to it so I use the powder to fill that in. It works well but makes your hair feel dirty and when you touch it, the color is on your hands. Also, if I'm caught in rain, it runs down my forehead. But I cant find another product that covers like this does. So I'm stuck. Great stuff, a blessing that I found this product. In my 60's and my hair is thinning. One thing I can tell you is if I don't use this people stare at the top of my head where my hair is thinnest, when I do use it no one stares. It looks natural. It does not smell. It stays on until I shampoo. It does not stain but if you flip a little onto your shirt it might smudge but will wash out in the laundry. Does not come off on your pillow. The brushes are hit and miss - sometimes there is one that doesn't hold up, but big deal. The compact is a little fancy, I never use the mirror. I use dark blonde mixed with a little salt and pepper for my gray hair that is dyed med ash brown. I love it. Please don't change or discontinue it. I've used this product for the longest time and I'm very happy that it was made for women like me who need to cover graying and thinning hair. MY HAIR IS VERY THIN SO I HAVE TO USE A LOT OF IT AND I RUN OUT QUICKLY. IN MY OPINION I DON'T GET ENOUGH PRODUCT FOR THE COST. I like this product, with some reservations. It is an improvement over crayons, "magic markers" and liquid root touch ups, but it doesn't last between shampooings - you have to add more every morning as it mostly wears off during the night. It's not that likely that the few colors offered will perfectly match your hair color (certainly not mine, anyway), which means that you will have to buy a minimum of 2 colors to mix together to get it right, which is pretty pricey for the amount they're asking. It's much cheaper to get regular permanent hair dye type root touch ups which never wear off. But those are time consuming to apply, and this powder is a good quickie alternative. For the sale price I'm willing to get my "2nd" color to see if I can get a closer match. MY HAIR IS VERY THIN AND THIS PRODUCT WORKS THE BEST OF ANY OTHER THAT I'VE TRIED, BUT IS TOO EXPENSIVE FOR THE AMOUNT OF PRODUCT THAT YOU GET. IT COMES OFF ON MY PILLOWCASE PLUS MAKES MY SCALP ITCH. I have been using this product for several years and have always been a satisfied customer. This last order, the product is not loading on the brush. I have to scrape the powder with the end of the brush to loosen, thereby, using much more than usual. Has the product changed in the manufacturing process? I've used this product successfully for years. My latest purchase arrived yesterday. I'm no grayer than I was when I finished the contents of my last compact a few days ago. The first thing I noticed was that I required much more powder to cover my roots than with my last compact, and a little grey still showed through. The powder also seemed a little messier; not holding together as well in the compact, so some was wasted. Lastly, when I was finished, I noticed short hairs all over the counter. I have long hair, but it was so weird-looking, I forgot and yelled, "OMG! My hair is falling out!" Then I realized the brush was shedding horribly. I finally threw it away and used my old brushes. Are the manufacturers cutting corners, since Joan passed away? If this wasn't just a bad batch, I might have to switch to another brand. Anyone else notice a diminished quality? Thank you. I ordered the product thinking that it might be good for between my hair lightening appointments. I ordered the lightest color but I have found that it doesn't lighten roots that are darker than your current hair color. Unfortunately the product won't work for me. When I read existing reviews, one customer mentioned that it works well on her eyebrows. I will try the product for that use so its not wasted. I had a bad experience my hair started fall out I was covering gray and sparse spots. I used it every day in the morning the more I covered the more I used. I went to the doctor she told me to stop using it. It covered okay pretty soon I was pretty much covering half my head. This product works okay but my hear really itched.I would recommed it use with caution. This is not a very good product to use when you are trying to hide hair lose. It is not worth the money you have to pay for it. I didn't think that the coverage was too good. I used it on my :sideburns" and on top of my hair in the back. I didn't think that the color was lasting or very true to my hair color. I'm still looking for a good coverup. The product dulls the hair and doesn't stay on the scalp. Rubs off when sleeping. I got BRUNETTE which should be a medium brown but is JET BLACK! the brush bristles are way too soft and don't work well to apply. Should be more firm. Brush should also be wider. It's also misleading because this does NOT make your hair "fuller" it merely darkens any parts of your scalp that show through your thinning hair! Like if you applied brown eye shadow to your scalp! RETURNING IT!!! really Joan! I use brown eye brow powder, so much cheaper and works just as well if not better. I used the fill-in powder as instructed. It was easy to use, and it help hide my bald spots very well. I like this product very much for the simple reason it adds volume to your hair while hiding shiny scalp and covers grays. I could not live without this product or at least I wouldn't feel comfortable about my hair if I did not use it. My hairdresser thinks my hair looks so thick and is such a perfect color match for me! She is now recommending this product to her other clients because she knows how much it has benefited me!! This product is fantastic for thinning hair. I used to spend more time fussing with the top of my hair trying to cover the bald spots, now I take less time because it looks like I have more hair! I am so happy that I don't need to go out and buy a hair piece. I honestly wish I could say I don't need this product because I have lushes beautiful hair but that is simply not true. My hair has never been thick and glorious but as I have aged it has thinned and thinned. It is hard for any women to see her scalp and this product is an absolute must for all of us who have thin hair! I use it ever day without fail, goes on quickly, covers perfectly, stays on until I shampoo it out. I would not go a day without it. It gives me confidence and makes my skimpy hair look amazing. I can't ask for more! I would buy this product forever!! Does a wonderful job of touching up roots in-between colorings and stays put for a good amount of time. Being in mylate 70's I have some spots that are thin. This product covers that well. I color mjy hair and before my nerxt color job is due, gray starts to show. This product blends right in with my natural color and the gray is gone! Used between color touch-ups at the salon to cover grey hair & also to cover thin spots. Easy to apply & gives a much thicker looking hair. I'm very skeptical about most product claims but I'm very concious about my thinning hair around my temples. The thinning is very noticeable and I think, like male baldness and hair thinning, makes you look much older. Well, I tried this product and it's awesome. You can fill in your hairline, part areas, anywhere in your hair and you look as though you have a full, thick head of hair. It really added to my self esteem and I know it'll help other women. Try it. You're worth the [$] and will feel really great! I'm about to lighten my hair and will be purchasing a second color, blonde. Gave as gifts and they loved it!! Decided to try one for myself and it really works great! I apply it myself to my scalp with the enclosed brush. It's very easy to do. Then I realized that in my salt and pepper hair, I could add more pepper! When I had a haircut recently, everyone at the salon was fascinated at how effective the product is. My stylist really had fun with it...and the outcome was amazing...I had more body and more color, and looked years younger! It stays in and never migrates to my shoulders or my clothes. It truly is an amazing product ! Miss our Dear Joan Rivers :( Saw her several times in concert...she actually talked about this product. I have been using it for about a year. LOVE it! Does everything it says. Very natural looking. Only comes off when I wash my hair. If you have thin hair or want to cover your gray than this is the product for you. HAVE USED IT FOR 5 PLUS YEARS. WHY ARE YOU NOT MAKING BRUNETTE ANYMORE. I am so glad I purchased this product. It is easy to use. Does what it is designed to do. 100% pleased! I cannot be without this...I bless the day I heard about this from the great Joan Rivers...this is a lifesaver...I use it every time I wash my hair and style it....it works miracles and die the appearance of thicker fuller healthier hair. I use the Salt & Pepper as I finally stopped dying my hair and love how the silver stands out among the darker grey....the Salt & Pepper gives depth to the roots which add volume and hair strengthening ingredients...it's all good news for anyone dealing with thin hair. Applying to roots by parting hair and depositing with the included hair brush....fast, easy and stays put. This is one fabulous product that I will never be without. I am on my third order and love, love, love it! Have always had one small automatic part on back of head since youth that I was extremely conscious of and now never have to worry. Thank you Joan Rivers! My hair is really thinning out, I just love this product. I don't know what I would do without it. I give it a ten. I use this every day to cover my thin spots and it also hides my gray between trips to the beauty shop. I use hair fibers on the top of my head to hide the bald spots, but you can't sprinkle fibers on the sides of your head and this works just perfect for that! It washes out easily and doesn't clog your pores! Love this product it really makes my hair look thicker and covers where my hair is thinner. 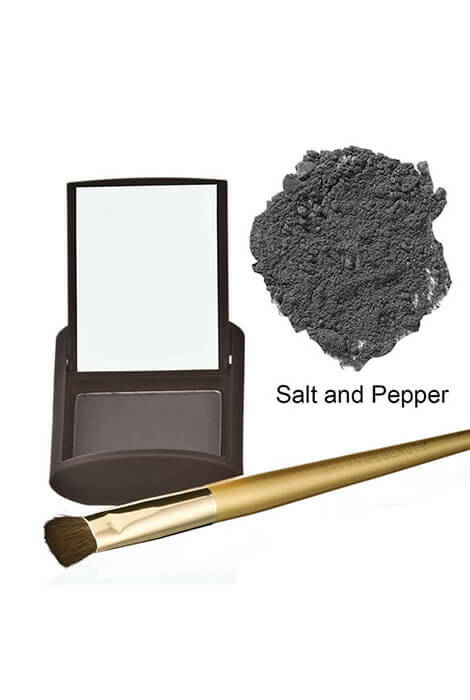 Very natural looking and easy to use. I will continue using this product. I feel so good knowing I no longer have "bald spots". I brush this product near my forehead and on my part where I see too much scalp. It works to cover those areas and looks totally natural. I start with a small amount and build up if necessary. It seems to last all day into evening. I really like this product, it is easy to use and totally effective. I highly recommend it. This product is best out there I wouldn't buy any other !! It goes on easy and covers the thinning spots. This is the best product out there. I've tried others but this is by far the best. I won't use anything else. This product works! It fills the bald spots, blends perfectly, is undected, doesn't flake, and stays put until the next washing! What else would anyone want? My sister uses this product: when she doesn't wear a hat! Great product the best around! Great! Last a long time for the price. I have used this product for years and will continue to use. This is the best product I have found to hide roots. I used to spray dry shampoo which worked well to cover roots but left my hair sticky at the roots. This goes on and doesn't come off until you shampoo and there is no change in hair texture.
" I love this product and have bought it over and over. " I use this product between my permanent hair color appointments to touch up and cover outgrowth. Sometimes can smudge onto skin around my forhead, but is easily removed with an alcohol swab! I have white hair and used the white powder to cover thin spots on my scalp. It worked very well and lasted the whole day without fading. easy to use, looks great, no more shiney scalp! After I blow dry and styly my hair, I apply the powder with it's brush on the areas that have less hair and/or the roots. I quickly blow dry the hair again just to get the excess powder off the head and hair. Finish it off with whatever you use to style, i.e. gel, wax or hair spray, (I use hair wax), style my hair in a messy fashion and I'm out the door. Love the product. Note, wash your hands after applying the powder. I keep it in a zip lock baggy in my bathroom. Powder tends to come out of it's container. Love this product. What a great ides for thinning hair. Covers and looks natural. Very easy to use. I read online reviews. An online shopping channel has a video. I make a small part and apply the powder from back to front as suggested. It totally camouflages my thin spots. I have light blond, short hair with thinning areas in the front. Great product and idea. To try something less expensive, purchase an eye shadow slightly lighter than your own hair color and apply it with a firm small brush. That works just as well in my opinion. They do make a white shade also. Great for hiding the bare scalp! Having gone gray in my 20s, this is a godsend! It's so much more natural-looking than combing in temporary color in between coloring. I absolutely love it--and I've tried everything! I have been using this product for over two years and have had wonderful results. It helps make my hair look less thin by covering the thin spots on my scalp. After seeing what it did for me, my hairdresser started using it and recommending to his other clients. Great product that really works!! This product gave me back some confidence having photos and being around people again. I have used this product for over a year. I use this product after a shampoo to conceal thinning hair. It works well to cover gray roots in between monthly hair color applications. The blonde shade covers well on light brown hair. A minor drawback is some powder will rub off onto the pillowcase at night. I HATE TO SEE PINK SCALPS. WHEN MY HAIR TURNED WHITE AND BECAME VERY THIN IT SHOWED MY "PINK SCALP".........JOAN RIVERS PRODUCT WAS DEFINITELY THE ANSWER..I LOOKS LIKE I HAVE A LOT OF HAIR AND"NO PINK SCALP!" I have had thinning hair for many years, and this is the best product I've ever found to cover the bare spots. It covers beautifully and I can leave the house feeling confident that no one can tell that my hair is thinning. This has given me a little more confidence about my hair loss, once I know what I'm doing it will be better. I am at the age when my hair is starting to thin. I also color, so I thought this product would be the perfect solution for me. I was more than pleased the first time I used it. My hair didn't become stiff and the color is a perfect blend. My head was thinning out!!! And lasts me one year!!! I have thinning hair and this product does a wonderful job hiding that. Love it !!! Great product--I love it !!! Great product--my front hairline is very sparse- this product makes it look like I have thicker hairline !!! It makes me feel so much more confident about my hair. People think I have thick hair. I don't!! Baby-fine and curly. I can't imagine not having one of these at home and one in my suitcase as I travel ALOT. I would definitely continue to buy this product. I use Joan Rivers Great Hair Powder to fill in the thin spots. What's great about this product is that it also makes my hair look so much thicker. It's light weight and blends well into my hair, and nobody knows it's even there! I get tons of compliments about how thick, full and beautiful my hair looks. It looks natural and makes me feel confident about the way my hair looks. I have used this product for several years and will continue to use it. I love it and won't be without it. Ya gotta try it ... believe me, it works wonders! I love Joan River's Great Hair Day fill-in powder! My hair looks so much fuller, my friends and even strangers comment about what a beautiful full head of hair I have. Little do they know it's really very thin. But then that gives me the best reason to tell them about this wonderful product. I wouldn't be without it. It's easy to use, last till you wash it out and looks so natural nobody knows you're using it. Even my hair stylist, and my husband says how gorgeous my hair looks. Every woman who has thinning hair should try this. You won't be sorry! In fact, you'll be getting so many complements about your beautiful thick, full hair, you'll wonder why you didn't try this sooner! have used it for years. a great product for thin hair. I have been using this for a year. I was very doubtful at first, my sister watched the infomercial and told me about it. My hair is very thin from medications and I have tried many shampoos, creams etc.,nothing helped. Soooo I tried. I was impressed to say the least. I use the brunette and have been asked by friends & relatives if I have a hair piece, what I used to thicken my hair and if I had a transplant. My hair style is short, so its not like I can maneuver my hair for cover. My biggest concern was perspiring, since because of meds in warm weather especially sweat drips from my head. It passed the sweat test last summer. It takes a little getting use to applying. At first I thought the brush was to small, it was blochy, but once you get the knack for your hair its great. Thank You Joan Rivers. This product CHANGED MY LIFE! I was so self-conscious of my thinning hair I did not want to even go to the grocery store anymore. Now I can look "normal" again! You just "dot" it on in the thin spots (on dry hair, not wet) working from the back - forward or "top down" and then blend a little (keep at least a half inch or so from your face). That's all you do! Then use hair spray, tease, or style, etc like you usually would. The powder stays on, have not had it come off unless I rub it, then i can see it on my fingertip. I am not sure how it would last if you swim with it though. Comes off slightly on pillow case but nothing major. It stays put pretty much until you shampoo it out. Also great at helping to cover gray roots between coloring as long as you don't put real close to your face. If your hair is light brown to medium brown... don't get the BROWN tone, it's too dark - get the BLONDE shade! The blonde shade is really a dark medium brown shade, and I don't mean light brown! Wish it came with a better quality brush (the bristles fall out). But other than that I love love love this product! I have used this before and am well satisfied. So easy to use. Comes with a long thin handled brush. Part sections of thinning hair and lightly brush on scalp. Style hair the way you want. Spray with a little hair spray and you are all set to go with a beautiful head of hair. It washes out with shampoo but you get a large compact size powder and you don' need much to cover so it lasts a long time. Use it to cover spots where I have completely lost hair and places where my hair is thinning. I have thinning hair on the top of my head. I will not leave the house without using this product first. I have used this for over a year and won't do without it. It is easy and quick and makes my hair look so much thicker! I use it to thicken my hair and to help cover up gray in a hurry. Neg. Just a little dark for blondes but it does do what I want it to do. This is a fabulous product. The long handled brush allows you to part your hair and then flip to the brush side to apply the powder. I always start from back to front because otherwise I find it doesn't look as natural. The color is meant to be darker than your hair, so don't expect it to "match." It looks better to have the scalp darker than your hair. Mine is a medium auburn. I always put the compact down on a tissue so that I don't have any powder residue on my counter. My aging hair is thinning on top, and this product not only covers my light colored scalp, which is now showing through my hair, but it covers the grey when I'm due for a color touch up. There's no mess on the pillow, and it lasts until I wash my hair. My once thick natural curly hair was thinning on top. Now, thanks to Joan River's Great Hair Day Fill in Powder, the real me is back with a full natural looking head of hair again. Yeah!!! Loads of compliments on what beautiful thick curly hair I have. That's when I tell them about this great product! It's so easy to use, makes my hair look and feel so full, thick and beautiful again, and no one can tell I'm using it...not even up close! Ya gotta try this...you'll love it, I promise!!! I no longer feel self-conscious about my thin hair. Great Hair Day is easy to use, but you may have to play around with it at first. If you don't like it getting on your hands, wear medical gloves while applying. I also pat it in after applying with the brush. I have scarring alopecia, which means my hair will never grow back. It is very thin, but using Great Hair Day creates a very good optical illusion. Also, it doesn't seem to cause any allergic reactions on my scalp as some other products have. It is the greatest. I use this product for thinning hair due to chemotherapy and slow return growth due to needed medications which slow the growth. Very easy to use, great for thinning hair. It makes your hair fuller. It covers your scalp and the gray hair. Great product. I use this product every day. Just adore it! I would be very miserable without it. It gave me more confidence. And I am very happy about my look now. I use this product to keep from being embarassed when going out the door. The best part is how it makes my hair feel thicker, and covers the gray. I would like, however, that you do not make it any pricier--I will no longer be able to afford it, if the price keeps going up! Has been Great Hair Days for 7 yrs. It is great for covering scalp showing through and has saved me from wearing a wig. It is expensive, messy and the brushes have become cheaper quality. That said I would recommend it to anyone. Have been using it for about 7 years. Beats wearing wigs. I never thought I would find a product for thinning hair that works so well! I truly would buy the product again. Toward the end of my time to get my color done. The purpose of this product for me, is to cover thinning hair. I am able to go to work without being self-conscious! When I want to look particularly good. I am 72 years old and have been using this for over 10 years. I only apply it when I wash my hair and it lasts until next time I shampoo. I love the way it covers the gray root grow out on my auburn colored hair, hides white scalp showing at thin spots and makes me look younger. Most baby boomers are unaware of the top of their head where they're sending scalp ages them more than any wrinkles. They don't see it, but everyone else does. Joan Rivers solution outperforms anything in the market. Easy to apply. Instant transformation that stays put until you wash it out. Works on more than just scalp! I don't have thinning hair, so I cannot comment on how it works for that. But it has great staying power! This stuff is fantastic for EYEBROWS! The powder lasts a very, very long time! I have even used it for eyeshadow and it stayed for a long time, too! The Best Thinning Hair Solution Ever! I have been using this product for many years. I was so impressed when I read how Joan developed this and why and when I learned she used it everyday I was sold! I never had beautiful thick hair as a young women. When life and age began to thin my hair to the point of seeing bald spots I was desperate for a solution. I tried all kinds of hair thickening shampoo, tonics, etc. but alas nothing and I mean nothing worked. After the first time I tried this I never looked back. So do yourself a favor ... try it. I know you won't be disappointed! Have used this product for a long time.......never lets me down even though my hair is thinner than it used to be. 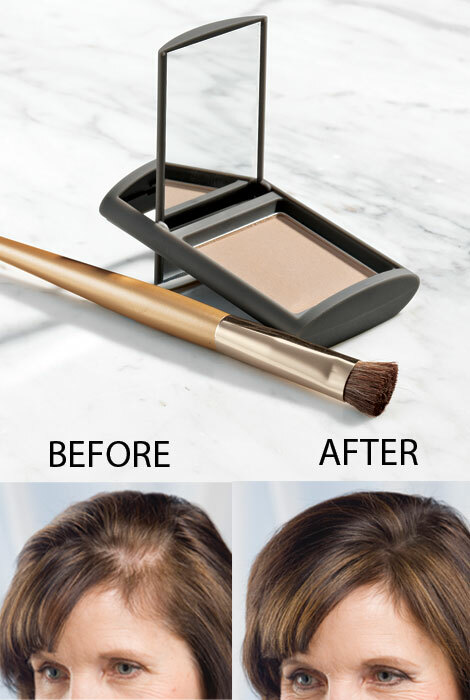 Great coverage for hair and for eyebrows. My 2 sisters also use it and we all love it. I love this product. I've had thinning hair for several years and I've been to a dermatologist who recommended I try Rogaine (which did work for me but eventually burnt my scale), Viviscal, which didn't work for me, bought a wig which I never wore, and then found this. I just apply it in the morning to my dry hair to the thinning spots and it stays on all day. It even makes your hair feel thicker/fuller. If I don't wash my hair that evening the next morning some is still on and I don't have to use as much that morning to cover the pink thinning spots. Love it! I've recommended it to several people. This has saved my thinning hair. All people with bold spots or thinning areas should use this. I don't have to use a lot every day but it really works. I have very fine thinning hair, my sister-in-law introduced me to this product and it is amazing. No matter how I styled my hair you could tell it was balding and it was stressful, but now I feel that great hair day feeling again. I use this product after washing and drying my hair. It is good to use in between hair coloring every 6-8 weeks. I use this every day for years. I have had no adverse effects and my hair has slowed/stopped thinning. This product covers the bold spots in a natural way. If you are not comfortable with your hair's thinner areas then this product is definitely for you. Since I am using this product I am feeling more confident about the way my hair looks under any kind of light. I highly recommend to anyone who has thin hair. Most products applied to the scalp have draw-backs. They come off before the next shampoo. They LOOK fake! They're the wrong color, etc. etc. This product actually applies easily and does not come off at the wrong time. There is no tell-tale odor, nor any mess when applied as directed. For the first time in years, I haven't been self-conscious about my hair. What a relief! I saw this product originally on QVC and have been using it for many years. It works well covering grey roots on dark hair and allows me several more weeks before I need to re-color. Good to see that I can order this from this site. Cover you thinning hair to blend in. Covers the balding spots and help blend into the hair for a fuller look. I use this product at my part due to thinning hair. Works very well and lasts a few days (but you have to practice using the brush effectively). Product color blends well with my highlighted hair's base color. It has made a positive difference in how I feel about my hair. Product works as stated. Smell takes getting used to. I have used this product for many years! I have used Great hair day fill in powder for years. My daughters and one close friend ( whom I have confided in), tell me they can never tell I am using it! My hair is embarrassingly thin and bald in spots. This product works great to conceal my problem areas. The only problem with this product is that the fine powder gets all over the sink when applying. I apply it to scalp after washing & drying hair to hide thinning areas. I actually look like I still have hair so I am so gateful to have it. It is messy getting on the sink, counters, pillow case, and my fingers if I touch my scalp-but can't imagine not using it as I am no longer embarrassed to be in public. I love the fact that it isn't a liquid and is not messy. My hair is extremely dry and I only wash it every 3rd or 4th day; so, I was delighted to find that this product remains in place until the next wash. My only complaint is that my brush comes apart. I have glued it together 2 times now and I'm hoping this time it stays. Oops, also I'm wondering if anyone thinks the powder is a bit dulling. Even so, this is the best product I've used for both thinning and to hide gray roots between colorings.I'm buying my 2nd set today and will continue buying them for a looong time. Thank you Joan Rivers. Love this powder.Never stop selling it! I'm so glad I found this product. I use the blonde powder for a naural eyebrow look. I had a severe fall which left me with a "dent" in my eyebrow. 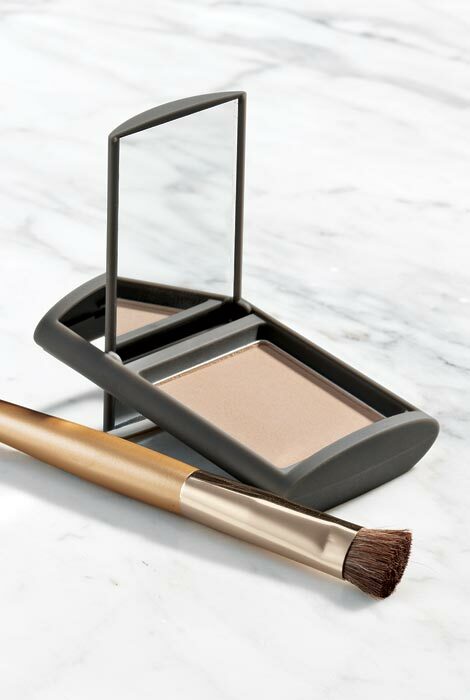 The powder allows me to "create" a brow where there is little to no hair, yet looks quite natural, especially if I use a toothbrush or other small stiff brush to smooth and lighten the look. There is little feeling left in the area, so I had to practice, but now works as well as it did before my accident -- no small thing for a blonde. My hair is thinning in the back. I part the hair with the tip of the brush and apply powder to part. It makes a world of difference in the appearance of my hair style. I've been using this product for many years. I really like it but it comes off on my pillow and I notice I tend to scratch my head more and it gets under my nails. The other thing is you don't get enough for the price. I also changed my hair color for the very first time and had to buy a different color. Starting to thin around the temples. Very noticible when hair is pulled back. Product helped to hide the thinning hair. I am a redhead - light aulburn. When I opened the package I thought color was brown, but when blended into the hair it truly worked and was not noticible. If you are more of a strawberry blond or a carrothead, it would not work for you because it does have brown in it. I've used this product for about 6 months now and it has really saved me. I don't feel self-conscious about my thinning hair anymore. It's easy to use and one compact has lasted over twice as long as advertised. The only downside is that if you scratch your head it gets under your fingernails and is IMPOSSIBLE to get out. (I have an itchy scalp because I also use a hair-growth product.) Using a tea tree oil shampoo helps with the itchiness, but it would be great to not have to worry about dirty fingernails! Otherwise, a very good product. Simply use as directed. I have alopecia and I think this product is amazing. I would be wearing a hat all the time if I didn't have this powder. Love it!!!!! I continue to buy this product! the hairless spots on my head. It does cover my thinning hair but it is so messy and it does stain. I waste so much because some of the powder falls off when I lift it off the case to put it on my hair. It has stained my pillowcases and I have to literally use a scrubbing cleanser to take it off my sink. It will not just wash off. Hides my wide forehead part! Very pleased that I finally have my full looking front part of my hairline back! Having shoulder length hair and pulling it back in a low bun for years has thinned out where I part my hair. This has bothered me so much! When I saw Joan Rivers product on sale I thought-"why not"? I purchased two in brunnett-one for myself, and one for a friend. One came damaged, the entire top layer was broken and came flying out in chunks all over my white bathroom! A very messy cleanup, but I'm returning it for a refund and have ordered 2 additional-as I want an extra one to travel with. I don't ever want to be without this product! I can't live without this product! I use this product every time I wash my thin hair when styling it. My hair is brown and I use the brunette shade mostly and use blonde near the hairline ( which shows up as medium brown on my scalp.) After applying it, I rub my scalp with the pads of my fingers to get the loose excess powder off and then wash my hands real good. Though, when I scratch my scalp it still gets under my finger nails....... but it makes me feel like I have more hair and hides my scalp well. I can't go without this powder and recommend it for thinning hair or between colors over gray areas. Product easy to use. It is long lasting, stays in until hair is washed. Washes out easily and completely. Works well and doesn’t rub off. This is the best powder to cover roots. I have tried others and this truly is the best. Makes my hair look fuller. It is kind of messy - the powder seems to get all over the bathroom and if you (or anyone else) rub your head it comes off on your hands! I've been using Great Hair Day for years, and it's an amazing product. I suffer from thinning hair and this is the best product I've ever found to help cover up the thinning areas and hair loss. I highly recommend Great Hair Day! I have used this before and like it. Great product to create volume for fine hair. Not difficult to apply. Used it previously and worked good. I have very thin hair on top and this helps to cover scalp making it less embarrassing to go out in public. I’ve been using this product for a few years now wouldn’t be without it I love this product covers well. Because it is easy to use and it works. You can also blend colors to match your own hair color. I am 83 years old and my hair has gotten quite thin. It honestly does fill in my bald places on my head & you can't tell it is a powder. Have used tis for years with good results. Is very effective. Will order it again. It works well and covers great I love this product. Best product I've ever used. Very neat and easy to use. I've been using this product for over 4 years now and haven't found any other that's comparable to Joan Rivers. Am going to try it. Have no opinion yet. The product is easy to use and looks great ! Such an easy improvement ! This product is great! I have been using this for quite a while and it gives my hair fulness and makes me look like I have more hair than I do. I never leave home without it. It does wonders in covering up my bald spots. Saw Joan on TV several years ago advertising this, didn't need it then, but need it now. So glad it's still available, even though our dear Joan is gone. I love her for creating this product to help us age as gracefully as possible. Used this product for almost 5 years. Tried others, but this product is by far the best! Better coverage and easy to work with. Thank you Joan Rivers forever in our hearts. Because it worked for Joan Rivers. 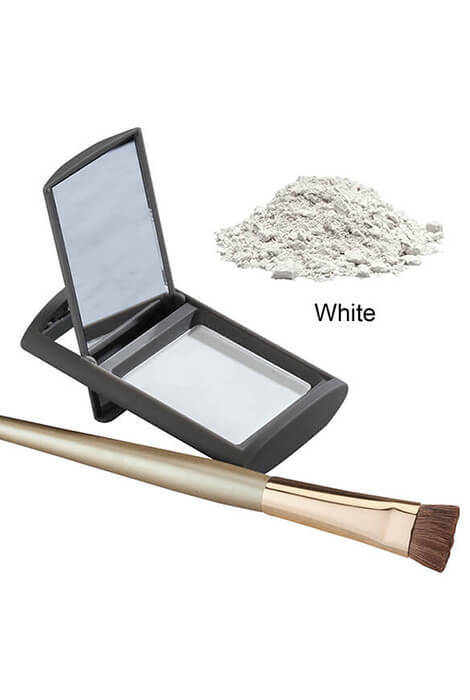 I have used this before as a fill in powder (where hair is thinner) and also to cover areas where (darn it) grey has grown in - between color or touch ups. The best and now at all messy. I wanted to try it, good reviews. This product helps me conceal my thinning areas around my edges, Honestly without this product, I would never go outside. This product is such a necessity in my life and I am always so afraid that this product would be taken off of the market and I would be forced to buy something else that does not cover as well. This is a Must Have for me. Thank You Joan Rivers (May you rest in peace). My hair is thin and this product fills in where needed. Love this product! Highly recommend! I have been using this product over 3 years. It is easy to apply and it does not get messy. It blends in well. I have been using this product to cover thin spots in my hair. Used for several years. Works great. Better than others for great coverage. This stuff work really well. It also come in a wide range of color. It last a long time. covers all my bald spots beautifully, doesn't fade, lasts until I wash it. Have used for years and love how it hides the thinning scalp. I'm a hairdresser and I use this product on my clients to cover up the grey hair in between their colors and use it to fill in the areas where the hair is thin to make it look thicker. It's my favorite and it really makes a difference. Need to fill in area on scalp. The last color i recieved was medium which I would like to order again. Idon't see as a choice in you choices at this time? BEST ANSWER: Thank you for your question. Unfortunately, we do not offer this item in a "medium" shade. 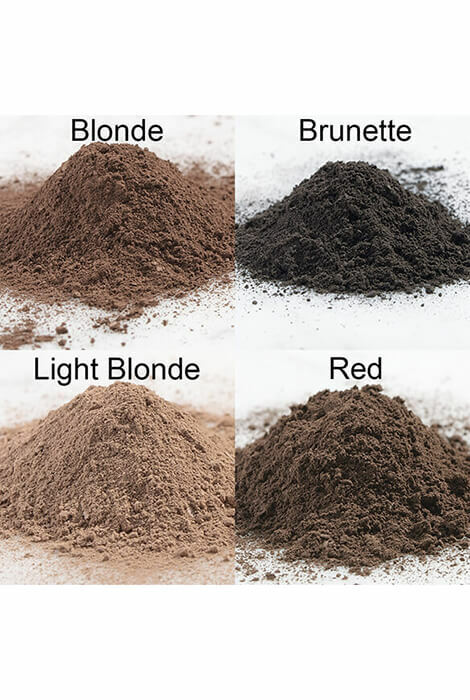 The available colors are red, salt and pepper, blonde, brunette, white and light blonde. We hope this information will be of help to you. i wash my hair only two or three times per week and im concerned that the product may clog hair follicles? BEST ANSWER: I would not be without this product. I wash my hair every other day or go even longer between shampoos and have no problems. It's just a powder that gives the illusion of more hair in thin spots. You will most likely have to touch it up each day but it is a great product. I have never noticed it on my pillow cases but it is a temporary product. I will never NOT have a backup in my bathroom drawer. It's also the first thing I pack when I travel. I may forget my meds, but not my hair cheat powder. I use this product and it is a great product. I would not be without it . It makes your scalp looks fuller and I did not notice that it clogs the hair follicles. I mostly use it after I wash and dry my hair and it stays until the next hair wash. may be a touch up depending on how hard you brush your hair. I love the product. I'm no expert , but I don't think so. It stays on the scalp and is harmless. I use it every day and I have no problem with my hair. I have to say that I love this product. I wouldn't be without it. Is it safe for pregnant women to use? BEST ANSWER: Thank you for your question. It is safe for pregnant women to use this hair powder. We hope this information will be of help to you. I was never pregnant when I used it. Maybe you should call the mfg. co. And ask them. It is a very good product. I liked it. I didn't use it when I was pregnant. Maybe your doctor could check the ingredients and see if they're toxic. BEST ANSWER: It depends on the percentage of gray in your hair and what color you want people to see. I have very little gray, so I use the brunette and it blends so well that you can't tell. I have thinning hair in one spot and this powder fills it in completely. I recommend the brunette, which is dark but when blended will look natural. I love this product! I have medium brown hair. I also have some gray which I have colored. I use the Brunette color. It seems better than going lighter. This product also makes my hair look thicker. It's the best! i would recommend the darker of the two. I have brunette hair with ash highlights and order medium brown because hi am attempting to take the shine from my scalp and also cover balding areas. Good luck. I tried a lighter color and I couldn't get much cover. I now use a darker shade and I am very happy with the result. It looks perfectly natural. My hair is between shades offered, so I use the darker shade to fill in and cover gray growth. I think it looks more natural. I've tried the brunette and it's very dark...I've changed to the next lighter color...I think it's dark blonde. I have dark brown hair and I buy the blonde color. It works for me. what if your hair gets wet? BEST ANSWER: It stays on. It and only comes off when you shampoo it off. I have used it for years Mechelle and love it. In the beginning when I first started using this I found the residue on my pillow. When I learned that a little really does go a long way problem solved. I hope this helps! This powder is not waterproof. That said, unless you get caught in a downpour or go swimming, it will hold. Until you really scrub your scalp with shampoo,mot pretty well stays in place and does the trick. Like in the rain? It stays on, in the pool some comes off. Sorry, my hair got damp but never wet until I washed it. Talc was not safe is it now safe in Joan river great hair day? BEST ANSWER: I have been using this product for many years and have never had a problem. Perhaps we are talking about two different types of "Talc" ... on your head vs other parts of your body? I am not sure but honestly, it sits on your scalp and washes off when you wash your hair. I am sorry I cannot be more specific but I certainly hope this helps. I think you mean talc with asbestos - that is harmful. Believe that the cosmetic talcs have removed the asbestos. Have used for over 5 years and have not had any health problems, but one never knows anymore. I'm comfortable using it. BEST ANSWER: Thank you for your question. From what we can see the Joan Rivers Great Hair Day fill-in powder is not tested on animals. We hope this information will be of help to you. BEST ANSWER: Yes you can use the fill-in powder after applying mousse and or gel and drying the hair. Use hairspray after the fill-in powder and styling. It is great! This helps to thicken your hair just like what it says - it's a fill in powder. I found that it's also easier to style my hair. yes you can, I put my powder on when my hair is dry and it stays on until I shampoo it again, it is great! Yes. I use mousse and hairspray frequently also. I apply the mousse and style first, then apply the GHD. I use it with mousse. I don't use gel or hair spray, so I only know that it is fine with mousse. Yes this product works with gels, mousse, hairspray, etc. I have dark blonde hair that is thinning in the front. I've used the Dark Blonde shade, and it is too dark, being basically brown. It is obvious on the scalp. Is the Light Blonde shade more of a taupe color, akin to dark blonde? or is it yellowish, which would not be helpful. BEST ANSWER: The color I use is called "Blonde" which is what I think you are referring to as "Dark Blonde." I have dark brown hair with highlights, and it works well for me. I have not actually used the Light Blonde, but if your hair is a true dark blonde, I think it would work well for you. The colors are usually a little darker than their name suggests. it's not yellow, though on a spectrum it would lean that way. i had the opposite experience. i went from light to dark. i can only say that i like the product very much. I've used this ever since it came out and I use BLONDE. My hair color is light brown with a taupe shading (not yellowish), Trying other brands, this is far superior. I would always go with atleast one shade lighter. My hair is a white grey. Would white work best or light blonde? I want my part to look filled in like the picture. BEST ANSWER: Blonde is not your hair color ... I am brunette with white roots and LOVE the product between color appointments during that 3rd week after... Use the grey or the color that best matches the rest if your hair. It's just a product to use for a very brief time between hair color sessions so roots are not seen. I AM NOT SURE ABOUT WHICH COLOR, BUT PROBABLY WHITE GREY WOULD BE BEST. IF YOU WERE BLONDE BEFORE GOING GREY, THEN PROBABLE THE LIGHT BLONDE WOULD BE GOOD. I USE THE SALT AND PEPPER MYSELF AND HAVE FOR YEARS. I think that I would use the white. The blonde might possibly make my scalp look yellowish and might appear dirty? WHY DOES THE "BRUNETTE" COLOR APPEAR GRAY IN COLOR ON THE WE SITE? I AM BRUNETTE AND WANT TO COVER GRAY ROOTS IN BETWEEN SALON VISITS. BEST ANSWER: It might be your screen color. Sometimes you don't see the TRUE color of something on the computer. But, if it's any help... it looks brunette on my screen. The "salt & pepper" looks gray. I was worried about the blonde shade looking too dark... but, amazingly it blends in. Go lightly at first.... and add more if it's not as much color as you'd like. Thank you for your question. The brunette color is a darker brown color when in the case. It does look like the picture does not have the proper light to show the color. We hope this information will be of help to you. Don't have an answer to your question but I use the Burnette and find it works fine on my brown hair. I have reddish brown hair not sure what color to use. I am afraid that the brunette is too dark and the red is to light? BEST ANSWER: I use the blond. Believe it or not, it goes with most hair colors. It is darker than you think and blends well. I too have reddish hair. Just make sure you blend it well with your fingertips. The red is actually not light but the blond works better. I bought three colors, red, blond and light blond. As I said, the blond is the best. Good Luck. I cab only tell you about what I do to my hair, and I hope this helps! I have brown hair, and I buy the blonde shade. After I brush my hair after use it looks like I have blended highlights in my hair. I get compliments on the color od my hair all the time!! If they only knew!!!!!! Good Luck! !